It is an exciting—and hopefully pivotal—time for new commitments to climate action: will you make some new commitments this Saturday at the Community Energy Fair at Scott Carpenter Park? Just last week, Hawaii became the first U.S. state to commit to 100% renewables—attempting to reach that goal by 2045. On June 18th, Pope Francis will be publishing a much-anticipated papal encyclical regarding the need for action on climate change. President Obama’s Clean Power Plan to reduce power sector emissions by 30% will be finalized this summer and global climate change mitigation talks are set to reconvene in Paris at the end of November. Here in Colorado, the last year has seen Clean Energy Action (disclosure: I work there as the Operations Director) intervene in utility planning at the Public Utilities Commission in the interest of stabilizing our climate, an unprecedented intervention based on climate alone. Meanwhile, this spring a Wild Earth Guardians lawsuit has threatened to shut down the Colowyo mine as it was expanded without any public comment. Here in Boulder, the city continues to explore municipalization as a means to replacing dirty coal power with clean, reliable and low-cost power. How can you get recommitted to taking action on climate? On Saturday, June 20th from 10 am to 4 pm, Clean Energy Action, along with a host of partner organizations, businesses and city programs, will be hosting a Community Energy Fair at Scott Carpenter Park. Feeling uninspired? Speeches from experts like Hunter Lovins, NREL’s Chuck Kutscher, and Ken Regelson of EnergyShouldBe.org should inform and reenergize. Interested in learning to install solar panels? Check out GRID Alternatives, a nonprofit that trains volunteers to install panels on the homes of low-income homeowners. Curious about municipalization or how Boulder can become a zero waste model for other cities? 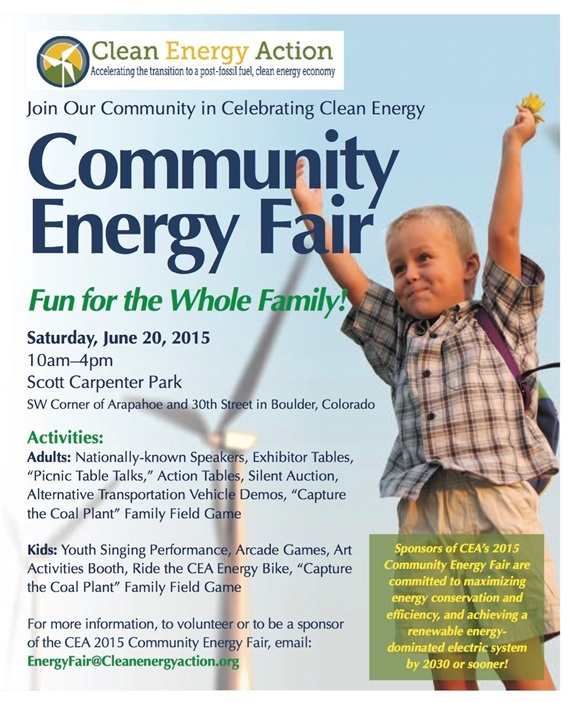 City of Boulder Energy Future and Eco-Cycle will be there. The Fair will offer opportunities for families and children to learn about energy and climate action, including bikes that generate electricity, clean energy and efficiency exhibits, and a Capture the Coal Plant game. Kids can stay busy with art activities and face painting, while grownups learn about getting solar on their homes and check out the newest electric vehicles. Saturday’s Community Energy Fair will be a great opportunity to get reenergized about climate action here in our local community. UPDATE: Find the schedule of events here.